My two best friends are visiting me this week-end. We know each other for more than ten years! Unfortunately we have different lives and we don’t see each other as often as we would like to. Anyway they are here now and we have planned a lot of recipes for you in the coming days! So we begin with Provençal Tomatoes! Pre-heat your oven at 200°C (400°F). Core tomatoes and cut in two parts. 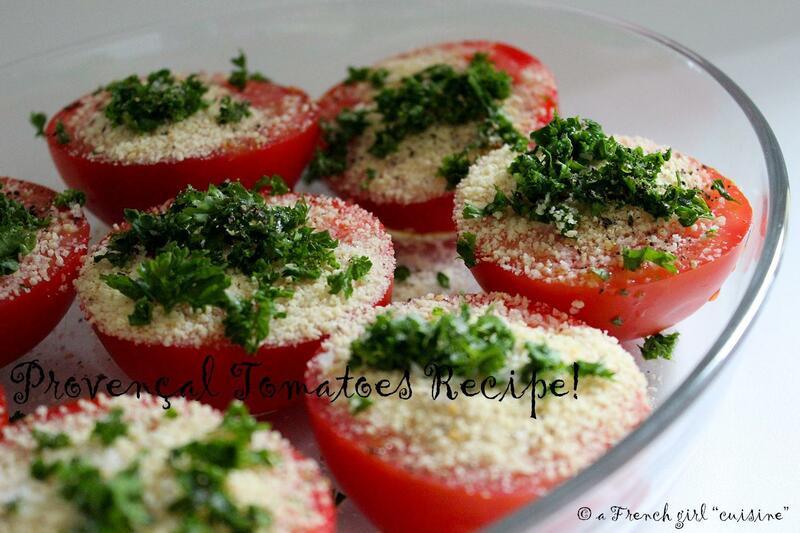 Add 1 teaspoon of breadcrumbs, a pinch of parsley, a trickle of olive oil, salt and pepper on top of the tomatoes. Bake 30 minutes and serve. They look yum and so simple. Will make!